totally repurposed, Second Hand Store to benefit animals. All items have been selectively reviewed to meet gently used standards. seasonal and holiday items and clothes. Helping Animals Live Tomorrow (H.A.L.T) Rescue. The proceeds will be used to provide veterinary care, spay and neuter, food, transportation and community outreach support for needy families with pets. The store is located at 234 H Street. The house is quaintly situated among older businesses and a lovely shade tree. The house has a character of its own dating back to the early 1900’s. Each room is themed and decorated uniquely and filled with treasures. Still under construction is our puppy boutique. The puppy boutique will feature items for your canine pal including special birthday celebrations where your pet will be treated like a king or queen! There is off-street parking in the rear of the building. • The 2nd and 4th Saturday of each month at Tractor Supply Company on Calloway Drive. 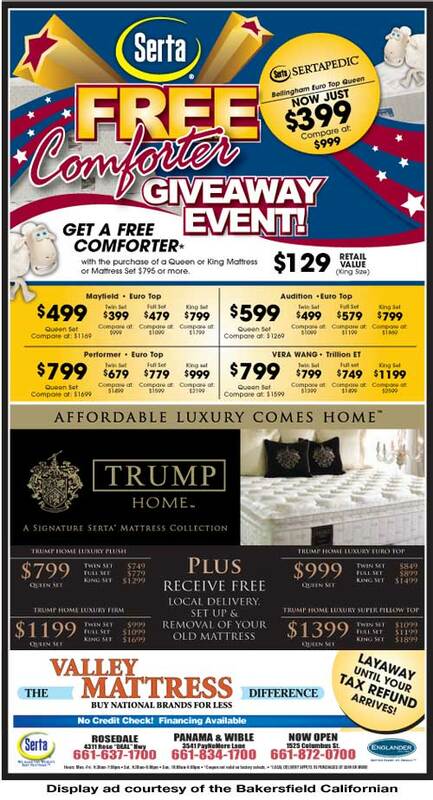 Your Locally Owned and Operated Mattress Company. at low prices. You can find all your sleep needs from movable bases, frames, protectors to sheets and pillows. Service, Products & Price Smash Guarantee! Ask about our 90 day comfort exchange. FREE same day local delivery on purchases of $599 or more. No credit check, lease to own.